Interesting confluence of ads in the Boston Globe today. And before you say, “Really, Hillary? Sam’s Club? 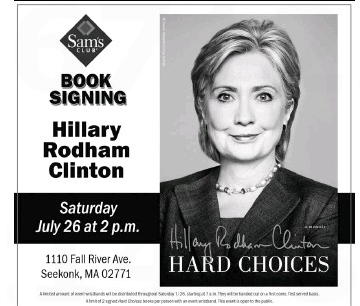 Seekonk?” you should remember that Walmart/Sam’s Club sells a helluva lot of books every year. You’ll find the website for the alphabet-soup coalition here. 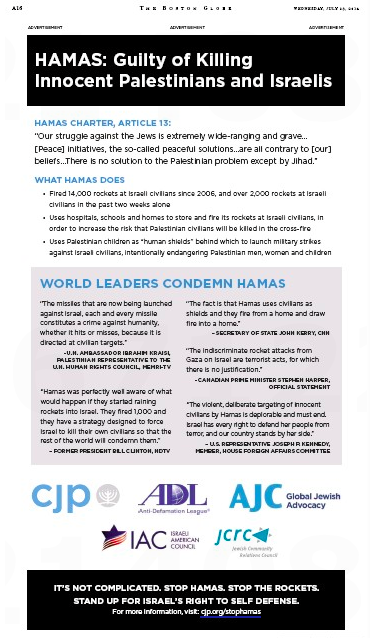 The hardwatching staff will be interested to see if there’s a pro-Palestinian/anti-Israeli rejoinder in the stately local broadsheet tomorrow. Meanwhile, crosstown at the Herald, ads (but not the two above) occupy roughly three of today’s first 30 pages. That’s hardly enough scratch to pay the Boston Herald Radio gerbils. To be sure, it’s mid-week mid-summer, but, man, they gotta be feeling some ad nauseum at the the thirsty local tabloid. This entry was posted on Wednesday, July 23rd, 2014 at 12:39 pm and is filed under Uncategorized. You can follow any responses to this entry through the RSS 2.0 feed. You can leave a response, or trackback from your own site.